This article is a review of BREATHE IN. Opening on a cheesy family photo shoot involving father, mother and teenage daughter, one hopes it is ironic, as BREATHE IN is the feature follow-up to excellent long-distance relationship drama LIKE CRAZY, from director Drake Doremus. Turns out, well… I won’t spoil the sequence’s significance. 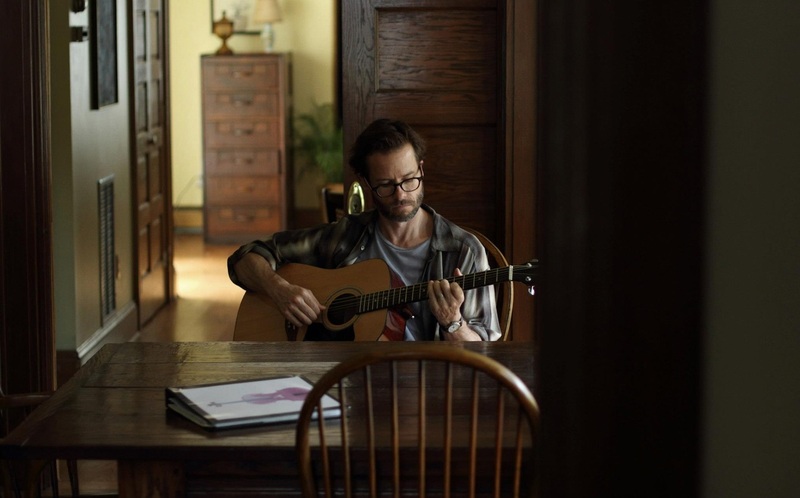 The father, Keith Reynolds (Guy Pearce) was in a rock band, and is now a high school music teacher. Hardly an unfulfilling job, but that midlife crisis is bubbling tangibly. In Pearce’s talented hands, he manages to convey that frustration without saying much. Remember how good he was in THE PROPOSITION? All taciturn turmoil. He and wife, Megan (the also gifted Amy Ryan), pick up 18 year old British exchange student Sophie (Felicity Jones) from the airport and take her to their home in New York state. During the journey, the current dissatisfaction from Keith pulsates. Playing in a symphony, he calls a “part time job”, while Megan refers to the performing as a “hobby”. The conservation has the tenor of one regurgitated many times. Sophie shares the bedroom of similar aged daughter Lauren (Mackenzie Davis). The former provides a somewhat new and exotic addition to the latter’s social circle, in particular, coming onto the radar of the ungentlemanly Aaron – a guy Lauren had a fling with and who let their school year know about it. Sophie also happens to be a reluctant, but incredibly adroit, pianist, drawing her and Keith together over musical commonality. And like so much of director Shane Meadows back catalogue, Doremus explores the impact of an interloper into a family/friendship unit. (See Meadow’s A ROOM FOR ROMEO BRASS for example). The unfolding here is almost unwatchably tense in places, as you will these people to put a break on their course. Insecurities and blind spots push them on regardless. As with LIKE CRAZY, the flaws on display humanise, though the inability to easily moralise is not as sophisticated as his previous film. Backstories unfold, fleshing out motivation. The close proximity of Sophie and the Reynolds clan is a touch paper, triggering nostalgia and regret; and those grappled for missing elements, needed for perceived fulfilment. Director Doremus is shaping up to be a gripping chronicler of disappointments.